Welcome! 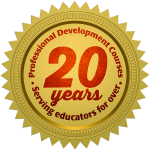 Professional Development Courses is pleased to offer a unique opportunity to hear directly from some of the best- known authors of educational books in the United States! Every few weeks a new author will be featured. Meet the writers of the textbooks used in our most in-demand courses! Authors of our most popular textbooks have written brief descriptions about the contents of their books and why they are relevant and applicable to today's 21st-century teacher. Find out directly from the author why these textbooks and accompanying courses will have a positive influence on your teaching and in your classroom. We hope this intimate connection will aid you in your journey to finding courses that will help you reach your professional goals. Enroll Now for Spring Semester Courses! Enroll February 1- May 31, and take up to one full year to complete your courses! Enroll in 15 credits on a single registration and receive a Certificate! Click here for more information. Request Your 2019 Course Catalog! Click here to request your copy today. You may also download a PDF of the catalog here. Need catalogs for your school? You can request multiple copies for your colleagues. In addition to receiving graduate level, non-degree semester credits, students may now earn Professional Development Certificates related to curricula content, classroom management, and teaching strategies. The Professional Development Certificate Program is primarily designed for classroom teachers and school administrators. This is part of the university's continuing effort to provide lifelong learning opportunities for educational professionals throughout the United States. The certificate is an acknowledgment of the extra effort put forth by our students to enhance the classroom learning environment and to improve professional skills and knowledge. Without a starting point, technology integration can be overwhelming for teachers. By the end of this course, you will have an entryway into the successful integration of technology. You will begin by exploring online technology applications and sites that support student learning. Protocol design resource questions will help you identify how to redesign current lessons to seamlessly integrate technology. At the end of this course, you will have a toolkit of applications and sites to get you started in technology integration specific to the academic needs of your students. Getting started can be the key to opening the doors to successful technology integration. With the projects in this course, you will develop time-saving shortcuts that can transform your students' learning and enhance your classroom! By following step-by-step instructions, you will learn how to use Read Aloud, mail merge from a database, and Smart Lookup! You will be able to insert SmartArt, WordArt, and shapes to create graphic organizers. you will learn to set tabs to create forms with lines and dot leaders, and so much more! This course is designed with the novice in mind, but more experienced users will find value in the tips and techniques demonstrated through relevant through relevant and applicable projects. Word 2016 is a requirement for this course. PowerPoint 2016 is a useful presentation tool for communicating information visually to engage an audience. Projects in this course are designed to be applicable and relevant to classroom and professional presentations. By following step-by-step instructions, you will create projects such as, but not limited to, creating a motion path with animations to pan and zoom, inserting a picture in text, adding linking options, inserting and customizing SmartArt and WordArt, modifying a slide master, customizing a background and theme, creating action buttons with hyperlinks, and adding PowerPoint speaker notes and handouts. Microsoft PowerPoint 2016 software is a requirement for this course. All instructions are written for a PC. English Language Learners' Struggles: Signs of Difficulty--or Disability? Most teachers are now encountering students who are not native-born, are not native English speakers, and are thus learning English in addition to their normally required subjects. Such children are especially challenged as they work to master reading English. The English language is not easy. Consider the difficulty that even native speakers have with speaking, reading, and writing it, the variety of dialects found across English-speaking countries, and the often-wide gap between “street” and “academic” English. It is thus expected that many English Language Learners (ELLs) will have difficulty. Some students will have more difficulty than others, for a variety of reasons. One reason might be a Learning Disability. Because many of the errors shown while learning English are the same in normal and in Learning Disabled students, teachers often cannot be sure how to help, and there is a risk of miss-assigning students to Special Education. The two books in this course will help teachers approach this dilemma. The books provide evidence-based material that offers practical help to both teachers and ELLs. Studying sociology plays a key role in understanding the social influences that make individuals who they are and govern how they function within society. It also gives insight into how people take action and make changes that affect tolerance and acceptance of one another, and how they prepare for the technological, environmental, and societal changes to come. Through the study of a wide range of current articles on sociological research, students will be provided with information that can be used to develop and refine their sociological perspective to better understand how current events shape the way society is structured. Topics include, but are not limited to, culture, politics, education, economics, gender and societal inequalities, social changes, and the future of our society. Transform your classroom and enhance your skills with Excel 2016! The hands-on projects within this course are easy to understand and designed to be relevant and immediately applicable to the classroom, and they will introduce and reinforce Excel 2016 skills. By following step-by-step instructions, you will create a table of personalized learning profiles, student assessment results, teacher purchases, blended learning interventions, and a student database. You will also create a standards-based rubric, a blended learning lesson plan, address labels, and graphs and charts for data analysis. Excel 2016 might look intimidating at first glance, but once you discover the ease of using Excel to organize data, use formulas to perform calculations, and create charts, it will encourage and excite you to use spreadsheets more and more within your classroom. Excel 2016 is a requirement for this course. All instructions are written for a PC. Students will visit a natural history museum of their choice and explore the significance and history of the exhibits/specimens. A Natural History Museum is a great place to learn about our planet and all the physical and biological wonders that make up our world. Whether it is a small museum focused on the local flora, or a specific museum focused on dinosaurs or minerals, or one of the larger museums that encompasses all the major sciences, you can learn much about the history and evolution of our planet, its inhabitants, and how it all works. This is an introductory course for teachers who want to learn more about coding. At the end of this course, you will have the tools to guide your students as they learn to code, and you will be able to understand and provide a rationale for why students need to learn to code. This course will provide easy-to-follow instructions for creating projects that will build teacher confidence and expertise that can be passed along to their students. After creating the first project, it will be the start of your enthusiasm for learning to code. Even though students may surpass teachers in their understanding of code, teachers taking this course will unlock the mysteries of code and have more tools to teach students persistence, focus, organization, problem-solving, and computational thinking. As classroom teachers, it is important to help students learn to code because it will help them develop 21st century, academic, and real-life skills. Hands-on learning experiences, with detailed instructions, will make this course fun and practical using Scratch, a free online web-based program. Principles of efficient and effective learning and teaching are presented in highly approachable texts based on decades of research in cognitive psychology. Traditional study habits - underline, review, memorize, cram - are ineffective and waste time. Better are questioning, self-quizzing, spaced retrieval and avoiding traps that lead to false confidence. Traditional teaching methods - lecture, homework problems, test - similarly are less fruitful than focusing on what students will think about during lessons, relating current content to already-present knowledge, and encouraging deep understanding. The two books approach the same issues from complementary viewpoints. The course first presents research and practical approaches to making your learning more efficient, and as you experience these methods, you can appreciate how effective they can be for your students. The course then focuses on research and practical approaches to your teaching. While you know your own, adult, ways of learning, your students may approach learning entirely differently. You will learn new ways to keep them focused and from going astray.